Many of you have probably heard of the flooding on the Mississippi this spring. It is a captivating story of devastation and beauty and is tragic every time it happens. Being removed from the situation, we here are fascinated by the actions taken both by large scale bureaucracies- the Army Corps of Engineers- and local homeowners, families, and communities. For folks interested in some good writing about floods, we recommend heading over to mammoth and checking out their recent installments as well as the links they provide. 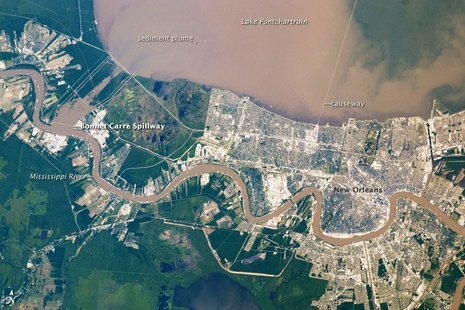 Here at FASLANYC we wanted to zero in a bit on the city of New Orleans as a follow up to our recent post on the land-making machine and the Louisiana delta. Last year we looked at some of the hydrological infrastructures supporting the contemporary city and speculated that goatherds might be used in the vegetated spaces of the city as an alternative maintenance practice, with the little bearded munchers roaming the fecund vacancies of the delta, destroying weeds and engineering little ecosystems. Of course, the delta is not their original habitat, and if they had the misfortune to be in the Bonnet Carré Spillway when it was opened to ease pressure on the New Orleans river levee they would have been swept away as they were back in the 1940’s. Historically, urbanization at the site of New Orleans has occurred during four different empires- Mississippian, Spanish, French, American- and was always more an imperial commercial and military outpost than a population center. Each imperial regime imposed different techniques and practices for living in the shifting, volatile geology of the region. 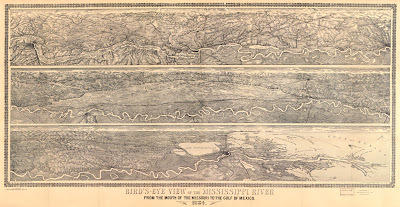 The French and Spanish, beginning with DeSoto’s ill-fated expedition and Bienville's dilemma, focused on mapping the delta and its network of lagoons, channels, islands, swamps, and forests. The result was the construction of a strategic geography for trade and military purposes. And though the maps belied a certain bias towards relative stasis- a wildly inappropriate assumption in the delta- they enabled a series of settlements, battlements, and canals for transportation and drainage. The city was important but small with a heterogeneous population of 8,212 including French, Creoles, Spaniards, Cubans, Mexicans, Acadians, Anglo-Americans, British, Haitians, and Canary Islanders in addition to free blacks and slaves [for whom there is less specific information]. The advent of the American Empire [defined by the creation of the frontier concept] with the concurrent adoption of the steamship and the navigation canal boom of the 1820’s-1850’s changed things, and New Orleans began to be remade into a population center. This came to fruition nearly a century later with the invention of the Wood Screw Pump and the implementation of flood control systems by the US Army Corps of Engineers up and down the mighty Land-Making Machine. But what about that fourth empire? How did they live? Little of their legacy is now legible; we have the fantastical Mardi Gras Indian tradition and the names of a few geographic entities (including “Mississippi”). But in light of the flooding of the river, what most interests us most about this empire are their mounds. 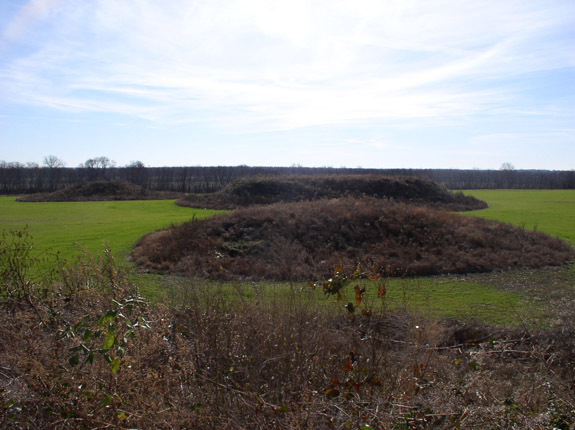 The Mississippians were a “mound-building people”, a fragmented and fractious empire loosely associated and bound together through cultural practices, trade, and their shared environmental situation. The capital was Cahokia- at the time the largest North American city north of Mexico- and is a prime example of this cultural practice of mound-building. 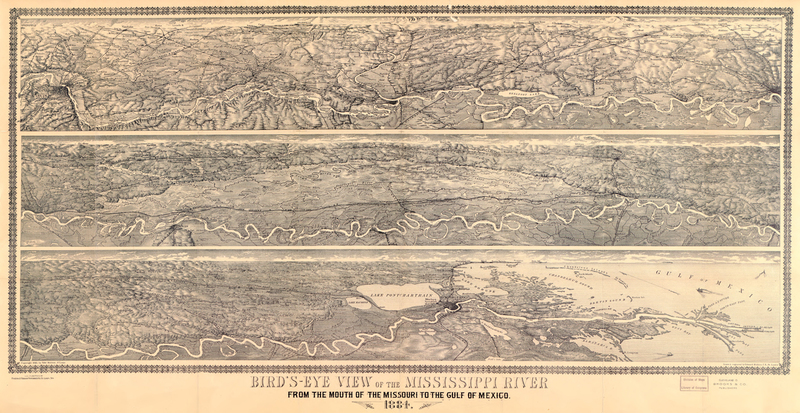 While the archeological mounds are laden with cultural significance [and this is what anthropologists tend to focus on it seems], these constructions can also be seen as a dispersed, cellular adaptation to the dynamic hydrological condition of the Mississippi Valley. The thousands of terror-stricken people who have taken to Indian mounds to escape the flooding Mississippi waters are showing scientists how the Indians probably used these earthworks which they built in pre-Columbian days. Pyramidal in structure, but with a flat top to permit erection of buildings, the mounds are about 150 feet in diameter and some fifty feet high. They are largely confined to the flood area of the Mississippi. 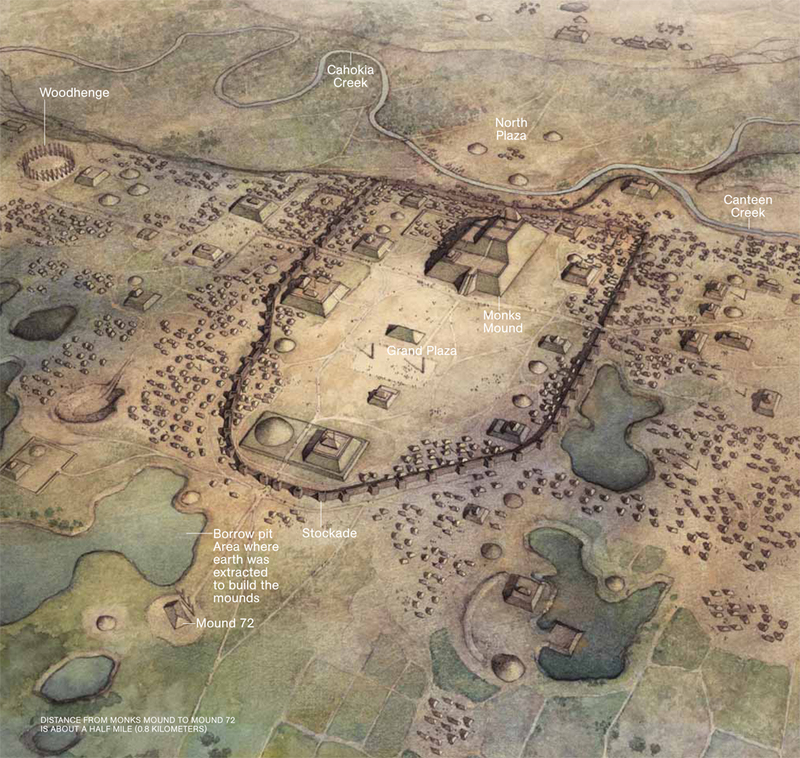 This practice of mound-building varied across the empire, from a few small hills near Kincaid to the imperial complex of Cahokia to the shell middens of the Louisiana Delta. It happened at a regional landscape scale- across the entire Midwest and much of the Southeast. And the mounds were not just burial sites, giant cosmological clocks, or the temple of the high priest; they were a multifunctional networked infrastructure- the construction of the territory as an articulated surface for resisting periodic inundation. 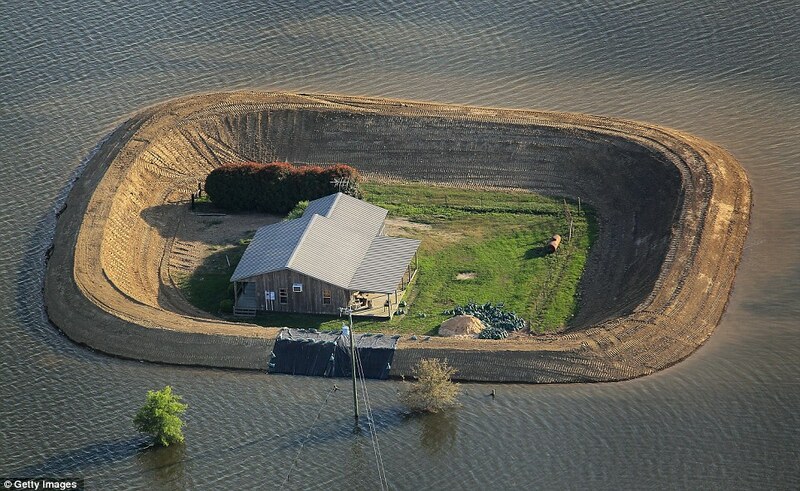 Formally these mounds and their function are reminiscent of the incredible constructions created by homeowners this spring to try and save their own homes as levees up and down the Mississippi were breached or blown, spillways were opened, and the Mississippi River reclaimed its floodplain for a time. Along with the tragic losses, inspiring stories abound of families and small communities collecting bobcats and sand bags and performing what we might call a “series of tactical operations” to try and save a house. In considering the city of New Orleans, we are interested in how this concept might be applied during the next generation. The draining and settling of the back swamp between the Mississippi River levee and Lake Pontchartrain first enabled the city to become the population center that we now know. 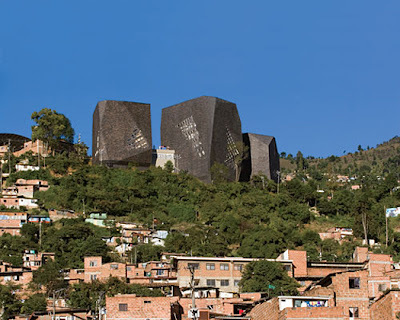 Rather than full-scale retreat, which seems untenable for a variety of social, economic, and environmental reasons, perhaps a new landscape theory drawing on the lessons from earlier infrastructural regimes could be developed to reconstruct the city as a hybrid of imperial outpost and population center that is able to resist inundation. Taking a lesson from the Mississipians of 1000 years ago and the Medellin architects of now, and utilizing the resourcefulness of people and animals resisting the flood of 2011, we could imagine a site in each neighborhood of the low part of New Orleans- the church, the park, the school- being raised above flood level, with individual homeowners encouraged to acquire a small boat and to raise their own sites if they choose. A timber source for piles and a sediment source for fill would have to be identified, and new cultural practices instigated. But the result within a generation could be the construction of the city itself as an articulated surface. But I really love this (mounds) as a specific example of a peculiarly American infrastructural urbanism, because it demonstrates very clearly the reason for looking back to the way previous American societies urbanized -- it's not just that they occupied the same ground (the kind of historical precedent where a designer says "there was once a theater here, and so this restaurant will be theater-themed! "), but that there are specific strategies for responding to the unique conditions of the American landscape that are worth recalling. It's not "that's how it was", but "that's how it worked". They dealt with the same set of landscape processes that we do (and those processes are significantly different from the European models we tend to rely on), and that's why we want to learn from them, not because of some nostalgia for a pre-colonial past. I will probably turn this comment into a flood-themed link to this post. I could not stop reading; brilliant! 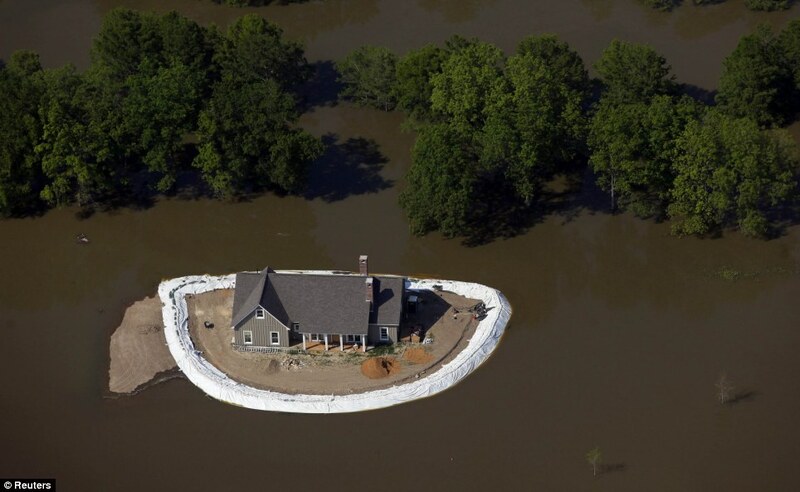 We should be glad the mounds remain as a precedent for responding to floods.